In large bowl, stir cookie base ingredients until soft dough forms. Press dough in bottom of pan. Bake 15 minutes. Meanwhile, in medium bowl, stir walnuts, granulated sugar, 1/4 cup butter, 1 teaspoon cinnamon and the salt with fork until mixture is well mixed and crumbly. Sprinkle nut mixture evenly over partially baked base. With hands, crumble frozen fillo shells evenly over nut mixture. Bake 18 to 20 minutes longer or until golden brown. Meanwhile, in small microwavable bowl, microwave 1/3 cup honey, 2 tablespoons butter, the brown sugar, lemon juice and 1/4 teaspoon cinnamon uncovered on High 1 minute or until bubbly. Stir in vanilla. Drizzle honey mixture evenly over fillo. Cool completely, about 2 hours. For bars, cut into 6 rows by 4 rows. Before serving, drizzle 1/2 teaspoon honey over each bar. Store covered at room temperature. 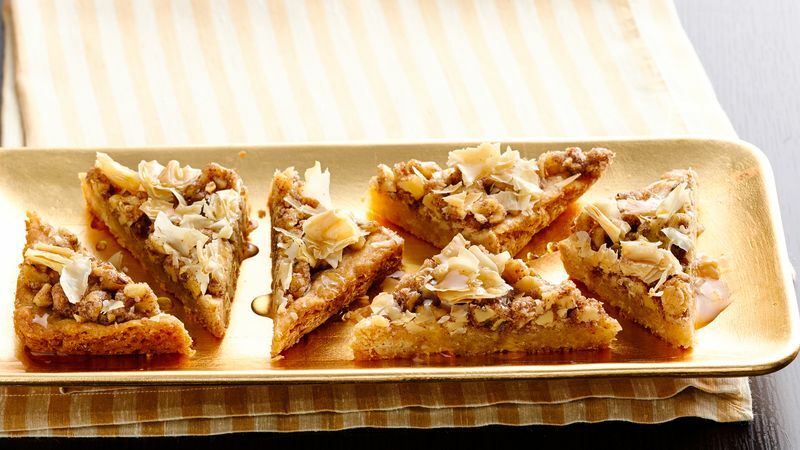 Baklava (bahk-lah-VAH) is a sweet dessert made with layers of butter-drenched pastry, spices and nuts. A honey-lemon syrup is poured over the baked warm pastry and left to soak. The dessert is traditionally cut into triangles. You can find mini fillo shells in the freezer section of your supermarket.